Here at MarketingExperiments, applying the scientific method to digital marketing campaigns is at the heart of what we do. As digital marketing, A/B testing and optimization have become so important over the last 15 years that we’ve literally built the MECLABS Institute around them, a whole new language has sprung up around these ideas, complete with its own unique buzzwords, acronyms and industry shorthand. As marketers, particularly those just starting to test, it can be exhausting just figuring out how to talk the talk. To help you cut through the jargon and get straight to the heart of these terms, we at MarketingExperiments have created the Marketing and Online Testing Dictionary. 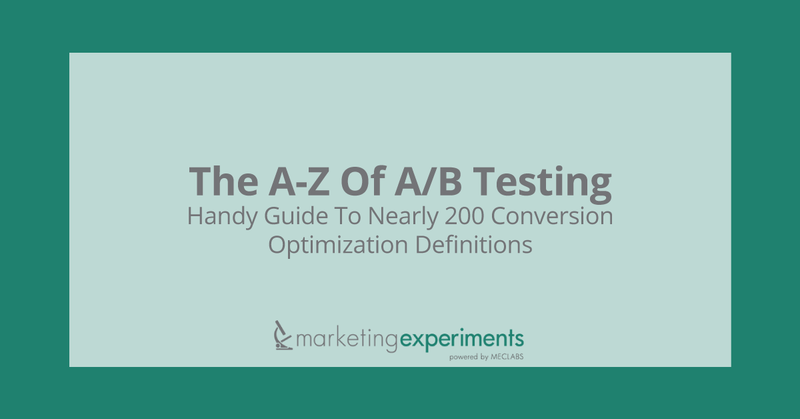 This tool not only provides definitions for nearly two hundred marketing terms related to A/B and multivariate testing, but also offers additional resources to help you learn more about many of the ideas and concepts presented herein. Download your copy of the Marketing and Online Testing Dictionary now, or risk being that guy or girl in the next marketing meeting, clumsily Googling optimization terms on your smartphone under the conference table while praying that your CMO doesn’t notice. This dictionary was a twelve-month process of research, reflection, collaboration and challenging the definition and fit of many of these words. Special thanks go out to Daniel Beulah, Bob Kemper and Jessica Lorenz for contributing to this project and Shelby Dorsey for editing the dictionary.